I love dosa's in any form be it rice dosa, wheat dosa or rawa dosa. 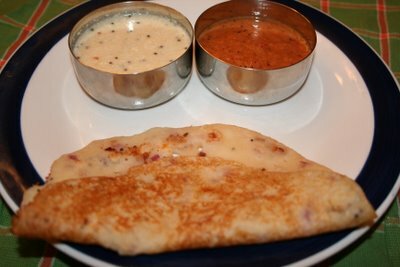 This weekend I was craving for dosa and decided to make rawa dosa as it does not take a lot of time. 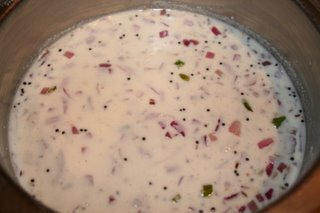 Mix rawa, rice flour, maida, salt with buttermilk and add enough water to make a paste in the same consistency as dosa batter. Heat oil in a pan and add mustard seeds, split urad dal and jeera. Once the mustard starts to splutter add chopped onions and green chillies. Fry till the onions turn translucent and then remove from heat and let it cool. Once this has cooled add it to the batter along with the chopped coriander leaves and let it rest for 15-30min. Heat a dosa tawa (flat griddle) and make dosa's with this batter. It tastes best if a tsp of ghee is used for each dosa. Serve hot with chutney and sambar of choice. I served mine with coconut chutney and onion chutney. Your photos make the recipes more mouth-watering. thanks meera. well most of the times its darshan who takes the pictures. I just tried it and is so tasty and easy to make. Thank you so much for sharing it. You hadn't mentioned as to how the batter is spread on the girdle. There is a general saying that Rawa Dosa batter should have a more loose cosistancy than normal Dosai. Also while spreading, one should try to form the periphery first and then fill in the gap in the middle. Do you agree to this view?